Do you love to bake? Are you someone who enjoys experimenting with different flavors and styles of baking? If so, you know how frustrating traditional baking pans can be. Not only are they difficult to use, but your baked goods and chocolates may also become stuck inside. If this happens, you don't have many options besides throwing out the batch and starting over. 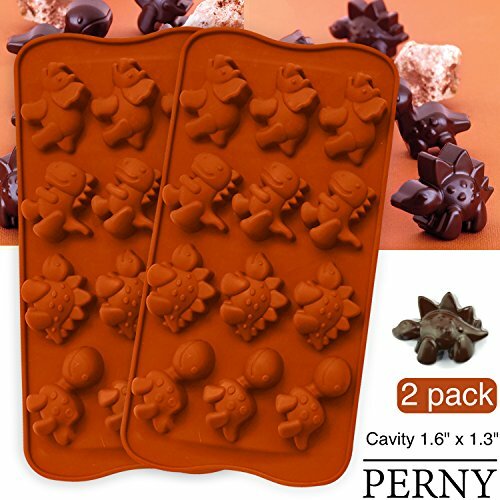 There is a better solution to consider: PERNY dinosaur candy molds / dinosaur chocolate mold. When you shop with NY Cake, you will find we offer a wide array of silicone baking molds, as well as chocolate molds. With our products, you no longer have to worry about your delicious treats getting stuck inside. You can simply bend the silicone to pop out the baked treats or chocolates with ease. This also helps prevent cracking. • Dinosaur-shaped molds create a playful look. • Material: Made of food-grade silicone, bpa-free. • Dinosaur Mold Measures: 8.4" x 4.3" x 0.6". cavities size: 1.5" x 1.3" x 0.6"
• Cleaning: with soap and water or use dishwasher. It can be used in the dishwasher, but hand-washing effect better than dishwasher. • Package: 2 x 12-cavity Dinosaur silicone molds. ✔ FDA approved dinosaur candy molds, heat resistant to 446°F, BPA-free design provides peace of mind. ✔ Nonstick dinosaur silicone mold makes cooking and cleanup a breeze.